Google rolled out its new mobile-friendly algorithm on April 21st, 2015, with the aim of improving the web for mobile users. To that end, sites that are compliant with their new mobile friendly best practises have been given a boost in the search results over websites that are not very accessible on mobile devices. For example a page coded for a large screen may end up being outranked by a site that is easily viewable on the screen of an iPhone. 1) Are mobile rankings separate from desktop rankings? Yes, the default search results shown to users of mobile devices are different from those shown to desktop users. This means the changes to the algorithm will only impact your site’s position in the search results of the mobile version. If somebody searches your keyword on their PC, your site will still be in the same position. 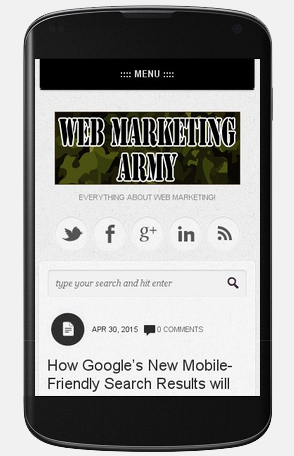 If your site is already optimized for mobile devices it may have jumped up the mobile search rankings already. 2) Does this impact each page individually or my entire website? Each individual page is taken in to account, meaning if one page from your site is optimized well for mobile devices it will rank well in mobile search, but if another page isn’t it will rank better on desktop search. 3) How can I tell if my pages are optimized for mobile? It is now easy to see whether your site’s pages are considered mobile-friendly by accessing the “Mobile-Friendly Test” from your Google Webmaster Tools account. You can run this test page by page or view an overall Mobile Usability report for your entire website. This is dependent on the last time the site was indexed. The report will list the number of pages with errors and what they are. For example, the font size being too small, or the use of flash content which mobile browsers can’t read. If you go through this list and make changes accordingly, your site should become more mobile-friendly in Google’s eyes. 4. If I have yet to make mobile-friendly changes to my site how long does it take for them to be recognized once I do? Unlike standard Google search updates mobile-friendly rankings are determined every time your page is crawled and indexed. Meaning if you make changes to your pages to make them more mobile-friendly today and Google crawls them tomorrow, it will recognize those pages right away. If Google tends to crawl your site slowly you can speed the process up in Webmaster Tools by using the “Fetch as Google” and “Submit to Index” features, for each URL you have updated. To do this in bulk you can simply resubmit your sitemap, which might already be setup automatically anyway. 5. How quickly are the new mobile search results finalized? When will I notice changes in traffic following April 21st? April 21st is the initial roll out date, but the mobile search rankings will not be finalized for another week or so as Google continues to crawl the web and find mobile friendly pages. You won’t notice significant traffic changes until Google crawls your site and other sites in your niche. Since mobile devices are now a very common method for browsing the internet it is important for you to follow Google’s guidelines and make your site more mobile-friendly. Failure to do so may cause you to lose traffic and sales.